Residents of Bernal Heights have a new reason to shop locally, one that rewards loyalty to the neighborhood’s mom-and-pop businesses with discount savings. Under a homegrown benefits program launched this summer, people who open accounts with a local credit union are awarded specially branded VISA debit cards they can swipe at participating businesses to rack up discounts called Bernal Bucks. “Think of them as frequent buyer miles,” said Arno Hesse, whose Bernal Bucks debit card is embossed with the rank “Money Maximalist” in capital gold letters. Hesse, born in Germany and living in Bernal Heights, is cofounder of Clearbon, the two-man software development company behind Bernal Bucks. The project takes cues from club card programs at corporate chain stores, but is designed to apply the loyalty-rewards principle to any business in the 1.3-square-mile Bernal Heights community. So far, about 20 of the neighborhood’s businesses have signed up to dole out rewards dollars to customers using the cards – at a rate of 5 percent of purchase totals. Rewards are tracked and tallied in online accounts on theBernal Bucks website. To redeem rewards, cardholders print out gift certificates they can spend at any participating business. The first iteration of Bernal Bucks involved removable "Bernal" brand stickers. 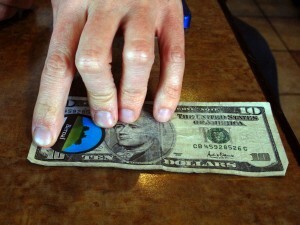 When presented to participating businesses, stickered bills netted small rewards to customers. That’s the challenge facing several similar grassroots endeavors springing up around the country in the tumultuous wake of the Great Recession. The economic meltdown and bank bailout “opened a crack” in the country’s collective faith in the financial system, increasing suction for innovative programs like Bernal Bucks, said Arthur Brock, an entrepreneur interested in virtual and complementary currencies. For his part, Brock is spearheading Denver Dollars, a spending program similar in form to Bernal Bucks, in the Colorado metropolis. One need only type “community currency” into an Internet search engine to get a sense of the range of alternative currency ventures cropping up around the country. The ones that take root tend to serve rural and remote areas. Some 30 miles north of San Francisco in Bolinas, for example, merchants honor locally minted $3 coins as a means of keeping currency in local circulation. The Berkshire region of Massachusetts trades BerkShares to help insulate the local economy. Further north, in British Columbia, Salt Spring Island honors Salt Spring Dollars. Such endeavors aim to channel enthusiasm for locavore culture into a currency exchange built on trust among neighbors. But not all of them have been successful. The Community HeroCard project in Hennepin County, Minnesota, was launched in 2001 on the back of a local debit card and drew participation from more than 5,000 residents and 40 businesses before collapsing in 2003. A postmortem evaluation of the project cited a lack of participants as the main cause of the failure. Arno Hesse, co-creator of Bernal Bucks, introduces his community currency concept to an attentive audience during the Future of Money and Technology Summit in February at the Hotel Kabuki in Japantown. Bernal Bucks is attempting to win a comparable number of supporters from the neighborhood’s roughly 25,000 residents. 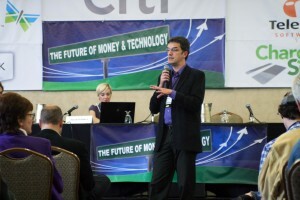 If the program takes hold, Hesse and his partner, French-born software developer and self-proclaimed “money futurist” Guillaume Lebleu, intend to market the technology to communities elsewhere. Hesse said neighborhood organizations as far afield as Brooklyn have expressed interest. Building an alternative currency from scratch doesn’t happen overnight. Bernal Bucks has undergone two major revisions since Hesse and Lebleu first introduced the idea, in 2009. The first experiment involved printing and selling removable “Bernal”-brand stickers emblazoned with an image of the neighborhood’s verdant hill, for $1 a piece. Participants stuck them to $5 and $10 bills, and the stickered bills rendered special rewards – $1 off a pint of beer at Stray Bar, a free pastry at Moonlight Café, an apple at Good Life Grocery. Hesse and Lebleu hoped the stickers would remind people to keep those bills in local circulation. Eventually, however, the stickers disappeared. During the 2010 holiday season, Hesse and Lebleu printed 500 Bernal Bucks-brand gift certificates – watermarked and bar-coded, and redeemable for $20 a piece. Again they were sold through community centers, and businesses were expected to provide discounts to customers using them. But the system caught on snags. Store clerks were confused about how to handle the certificates. Certificate holders couldn’t keep track of which reward coincided with each business. Customers without certificates didn’t understand why they didn’t qualify for Bernal Bucks benefits. “It was awkward,” said Melani Eisemann, co-owner of Avedano’s Holly Park Market, a butcher shop on Cortland Avenue, Bernal’s commercial corridor. Then, when Eisemann went to Hesse to exchange her store’s certificates for cash, he cut her a check for only 90 percent of the certificate totals. Five percent of each certificate was held for Bernal service providers and an additional five percent for Bernal Bucks. Hesse and Lebleu are confident that the debit cards will eliminate hassles and confusion. Swiping cards to accrue rewards is tried and true, they reason. The cards depict a cartoon rendering of the neighborhood’s satellite tower-adorned hill, and brands from Bernal Bucks, VISA and the Mission SF Federal Credit Union, the organization hosting the cardholders’ accounts. Heeding feedback from merchants on Cortland, the partners say they have installed safeguards throughout the system to avoid situations in which one business pays out more than its fair share of Bernal Bucks relative to its regular sales. They have inked agreements with about half the businesses on Cortland Avenue, and begun disseminating cards. Bernal Bucks: The Bernal Heights neighborhood in San Francisco launches an innovative hyper-local currency system with just local businesses in that neighborhood.